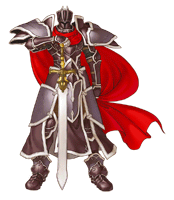 Official artwork of the Black Knight from Fire Emblem: Path of Radiance. The Black Knight (漆黒の騎士, Dark Knight) is a character from the Tellius games in the Fire Emblem series. The Black Knight is a major antagonist and Ike's rival in Fire Emblem: Path of Radiance and Fire Emblem: Radiant Dawn. He is a mysterious knight who serves the kingdom of Daein, whose identity is not known even to the king he serves, Ashnard. Regarded by both his allies and his enemies as virtually invincible, in addition to his immense strength and talent as a swordsman, he wields goddess-blessed armor and his sword Alondite, the counterpart blade to Ike's ultimate weapon, Ragnell. Ike first encounters the Black Knight early in Path of Radiance, when he witnesses the death of his father, Greil, at the hands of the Black Knight in a duel. Ike's desire to defeat the Black Knight and avenge his father's death is one of his primary motivations as he fights in the war against Daein. Ike challenges the Black Knight multiple times throughout the game, but is incapable of harming him until he obtains the blessed sword Ragnell. Near the end of the game, Ike and the Black Knight have a final climactic duel in Nados Castle; Ike emerges triumphant, and as Ike escapes the castle crumbles behind him, leaving Ike to presume the Black Knight's demise. In Radiant Dawn, the presumed-to-be-dead Black Knight resurfaces in the fight for Daein's liberation from Begnion as an ally to the Daein freedom fighter Micaiah. After saving her from an ambush by hostile forces, he comes to her aid in the final battle to free Daein, and again when Daein is pitted against Ike, his mercenaries, and the Laguz he fights for. The Black Knight reveals to Ike that he allowed Ike to win in their previous duel; after he realized that Greil had crippled himself, he wished to battle Greil in his prime, so he let Ike live so that he may grow stronger and the two could battle again. After the awakening of the Goddesses Ashera and Yune, as Ike and his party ascend the Tower of Guidance to challenge Ashera, he meets the Black Knight again. The Black Knight's true identity is revealed to be Zelgius, the commander of Begnion's troops, and the two begin their final duel, which Ike wins. Before and after their duel, Ike and Micaiah see visions that reveal the Black Knight's past as a "Branded" (one with both human/Beorc and Laguz blood in their veins), which rendered him an unaging outcast among both Beorc and Laguz. He was eventually taken in by the ancient Laguz Lehran, who was masquerading as Begnion's Prime Minister, Sephiran. With the Black Knight's death, Alondite accepts Ike as its new owner (though any advanced sword-wielder may use it in his stead). The Black Knight appears as a trophy and a sticker. He is also referenced in the form of the song Against the Dark Knight, which plays on Castle Siege. Black Knight trophy in Brawl. One of Daein's Four Riders and wielder of the blessed sword Alondite. Once an apprentice to Ike's father, Greil, the two eventually duel, resulting in Greil's defeat. Thought to be dead after losing to Ike and the blessed sword Ragnell, the Black Knight survives and comes to the aid of Micaiah, the leader of the Dawn Brigade, a band of Daein freedom fighters. The Black Knight appears in Super Smash Bros. 4 in several minor roles. His leitmotif, Against the Dark Knight, also returns in Super Smash Bros. for Wii U. The Black Knight trophy is exclusive to Super Smash Bros. for Wii U. Black Knight trophy in Super Smash Bros. for Wii U. Not even the other members of the Daein army know the truth behind this dark knight. He is Ike's rival in Path of Radiance and the sequel, Radiant Dawn. His mastery skill Eclipse is so incredibly powerful, it'd be understandable if you thought his defeat would bring peace to the war-torn land. It's said that the Black Knight's identity is a mystery even to the Daein army who he fights for. In Path of Radiance, he's Ike's mortal enemy, and this enmity continues into Radiant Dawn. His already fearsome strength is bolstered further by the skill Eclipse. He's so powerful that you might even expect him to be the final boss. A Mii Swordfighter dressed as the Black Knight. The Black Knight's armor is the basis of a paid downloadable content costume for Mii Swordfighters. 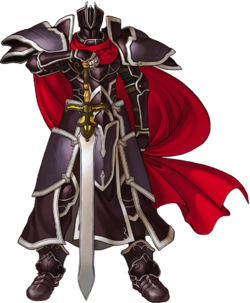 The Black Knight's color scheme also serves as the basis for one of Ike's alternate costumes. 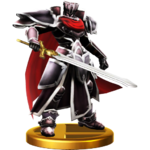 In Smash Tour, the Black Knight is a red item. A player using the Black Knight at the beginning of a battle will cause their smash attacks to occasionally have one-hit KO power at random for that battle. The Black Knight as an Assist Trophy in Ultimate. The Black Knight appears as an Assist Trophy in Ultimate. He moves across the stage slowly, attacking any nearby opponents with his sword, Alondite. His attacks are extremely powerful, and they trigger Special Zoom for most of the time. While he can be attacked and defeated, his HP is relatively high and he does not flinch from most attacks. Training Mode describes his Assist Trophy: Slowly approaches, and then executes several extremely powerful slashing attacks. Robert Clotworthy and Junji Majima reprise their roles in both English and Japanese via recycled voice clips from Fire Emblem Heroes. A “Black Knight Helm” Mii Headgear is purchasable from the Shop. The Black Knight’s official render from Ultimate. The Black Knight slashing Link on Tortimer Island. The Black Knight's official artwork from Fire Emblem Heroes. This page was last edited on February 27, 2019, at 09:48.